Simple Machines Forum (SMF) is one the best bulletin board software solutions around today, a lot of users believes that simply installing the software and creating topics and post is enough to rank a forum high in Goggle and other major search engines. This insinuation isn’t totally wrong considering that the software itself is optimized for search engines and works seamlessly with various modifications (mods) to give both search engines and users a friendly experience. Here’s top 10 tweaks and modifications to create a forum that is 100% search engines optimized (SEO). 1. The Faster, The Better! To make a SMF forum rank high in search engines, the load time, response rate and overall speed of the website must be taken into consideration. First, you need make sure that your forum is hosted with any of the top web hosting companies around and uses the cloudflare web performance and security services. Then, optimized the forum for speed using the tips and tweaks found here and here. If your forum is a niche one or just focuses on a particular topic group, manually approving only highly useful and SEO-optimized contents will be the best for it as this will make your forum an authority in its niche. Allowing link spam and low quality contents (Spam) won’t help your forum in any way. I’ll recommend reading our earlier article on how to stop link spam and bots registration on SMF forum for tips on how to make your forum free from bots and link spammers. For high traffic forums, the mods below will help you to run a search engines optimized forum that’s free from spam, bots and link farmers. Links and linking format is an important part of Search Engine optimization. In SMF SEO, the method of linking will make your forum stand out from others. I won’t recommend making all links “dofollow” for non-moderated forums as that will be like encouraging link farmers, spammers and malicious users. This way you can control, what links are rel=”nofollow”, rel=”follow”, external, nonactive or text links. Optimus Brave Mod for SMF takes care of every options needed to give your forum a good shape in the eyes of google and other tops search engines around. Optimus brave mod is a big player when it comes to simple machines forum search engines optimization (smf seo). Interlinking of post and pages is an important factor in search engine optimization of forums, bounce rate also is another factor to consider when improving the visibility of your forum in search engines. Related topics mod for smf can reduce bounce rate significantly as well as improve the internal linking of your forum pages. Popular CMS solutions out there has an option for this, using SMF doesn’t mean you should piss of your users by forcing them bookmark a topic they would like to visit again. Pretty Url Mod for SMF makes your url easy for both human and search engines to relate fine with. It will not double your organic traffic but will produce a friendly URL structure for your visitors. Social Media presence for your contents is another factor most search engines (including Google) uses to rank your website. Adding a social media sharing button/icon for your forum will improve your forum SEO and increase the organic traffic. There is this mod and this too that can help you integrate a social sharing button to a forum. Google Tagged works like a SEO tagging system that automatically creates linked topic tags based on what brings a visitor to that particular topic. This tags are displayed at the bottom of the topic thread, it can really strengthen the page authority for the search terms. NoFollow All Links mod works best for entertainment and gossips forum that have no need distributing link-juice. 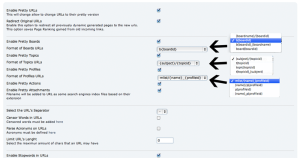 It adds rel=”nofollow” tag to both types of url ([iurl][/iurl], [url][/url]) tags. You can use it for forum that isn’t moderated to prevent malicious users from getting you into Google’s black book. It is advisable to opt for the link control mod in number 3 above to have a balance between nofollow and dofollow links. SEO and XML Sitemap mod in the other hand, is a nice XML sitemap mod that can be used for forums that isn’t using the XML sitemap functions of the optimus brave mod. SMFPacks SEO Pro modification a premium mod that lets you optimize a forum for search engines. It is like a combination of pretty url, SEO Sitemap and link control mod. Your blog is very informativ thank you so much……. I have a question about robots settings. I want surely index Sections and Discussions, but I have some doubt indexing replies. Do I have? They are a lot of pages. Indexing replies sounds legit as they can improve your CTR when they are improving on the topic of discussion. We travel nationwide to deliver the best google Analytics, Google AdWords, and Google Tag Manager Trainings to digital marketers everywhere. Thanks, i try to install all this mod but yet traffics aint visiting my blog at spyloadedng. any other thing to do?? These SEO tips are for simple machines forum websites and not regular blogs. As for your blog, you can add yoast SEO plugin, promote on social media as well as submit sitemap to Google, Bing and Yandex.